Liam was very knowledgeable and made sure our group made it up to the top of the hill. He knew where graves were that were not on his normal tour. Great visit. Our tour guide was extremely knowledgeable and made the tour very interesting. Two hours is the perfect amount of time to tour the cemetary. The only confusing piece was the instruction to ‘meet at the main entrance’. The meeting spot with the tour guide was actually inside the main entrance past the security screening area. Might want to change this instruction. Our tour of Arlington was inspirational, informative, thought provoking and everything we hoped for. Even with 30+ folks in the group, we could hear and learned so much. Thank you Viator! Our tour was better than we ever thought is could be. Liam was our guide and he was knowledge, energetic and entertaining. He kept us moving but always answered any questions we had. Would do it again in a heartbeat!! Liam was a great tour guide. He was very knowledgeable and friendly, even when a lady was hateful to him. We enjoyed the tour very much. This was money well spent. Liam our tour guide was awesome! He was very knowledgeable and very conscientious of the fact we had younger children and never walked to fast so they could keep up and enjoy the experience. Excellent tour of a memorable place to see. Liked walking tour despite being a cold morning. Liam, our guide, made the tour. He gave us much information about Arlington, it’s history, it’s statistics and it’s events. 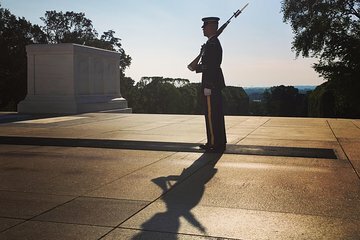 Recommend to everyone wanting to tour Arlington. Enjoyed our walking history tour of Arlington National Cemetary. Liam was respectful, insightful and knowledgeable about the cemetary. Very interesting commentary on the origins and those laid to rest there. 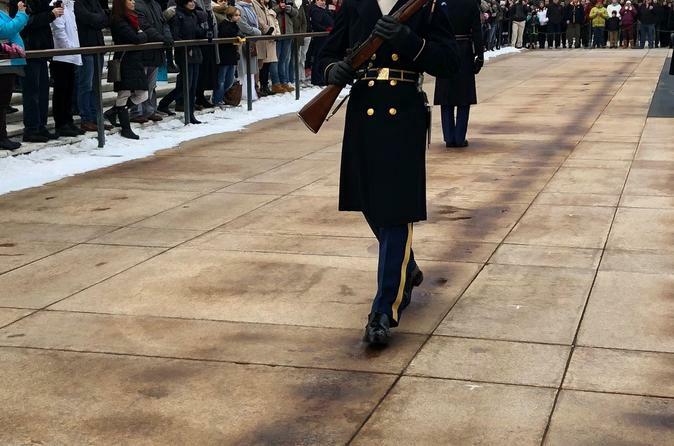 The changing of the guard was a touching tribute to the grave of the unknown soldier. My sister and I enjoyed the Tour immensely. Liam was our tour guide. He was very knowledgeable. The tour was uphill for the most part. Wear comfortable shoes. October is the best time of year to go on this tour. The weather is perfect!